If you can ignore the rather harsh tones and persevere beyond the first few seconds, this video will open your eyes to history, health and, indeed, statistics. Truly inspiring – and should be developed further and shown in schools! Oh! Death where is thy sting-a-ling-a-ling? 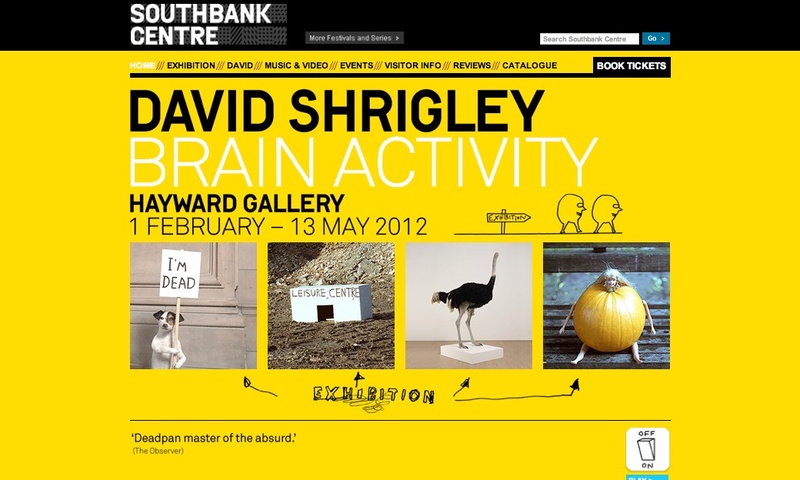 I finally got to the Hayward Gallery to see David Shrigley’s first major show in London. It was every bit as good as I’d hoped it would be. I’d love to cover everything here – but that would be impossible. There was so much to see and so much to think about. Many of the exhibits appear simple, childlike and quirky. And they are indeed simple, childlike and quirky, as well as being deep, a little disturbing and thought provoking. And witty and funny too. You can’t escape death here, or life either. There’s a gravestone, for instance. It doesn’t say R.I.P. It has no angel nor urn. No inscription states ‘Beloved husband of ….’ or some such traditional phrase. 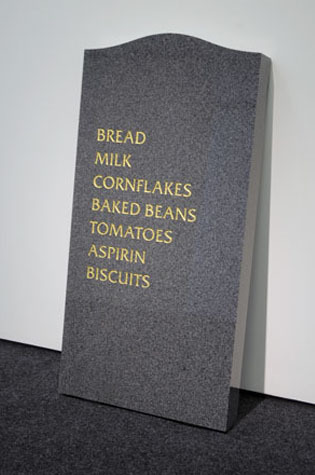 Instead we get a shopping list, carved into the marble, picked out in gold leaf. In the midst of life we are in death. Indeed we are. A little puppy holds up a placard stating ‘I’m dead’. There’s a dead rat, almost hidden under the skirting. A squirrel sits with its own head in its paws. I don’t want to give the impression that this exhibition is gloomy. Far from it. It’s crazy, weird – in the nicest possible way – and fun. Death, however, has a habit of cropping up throughout, overtly or covertly. Just as it does in the real world. The black and white cartoon of an aeroplane coming in to land has a text that reads ‘I find it hard to concentrate while performing important tasks.’ Yikes! A bus driver states baldly ‘I can’t believe that they would let me drive a bus.’ Oops! It sets your mind spiralling off to dark and dangerous places. This witty and wonderful artist made me think, smile and laugh out loud. The big bad wolf in hospital, on a drip. A biscuit nailed above the lift with an unnecessarily large nail. A bone serving as the hand of a clock. A door, labelled ‘a door.’ A tiny little wee stick figure out on the enormous terrace. 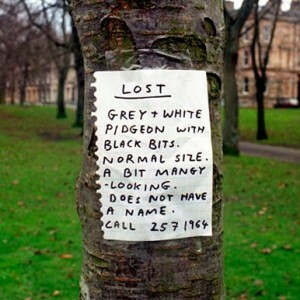 A lost pigeon. A spy hole in the wall concealing a pinky-purple, satiny creature coiled around itself, like an intestinal worm or an elongated carrot. With a face. If I wrote about everything I’d be here all night. As it was I took about two hours to go round, moving back and forwards, finding things I’d missed the first time. I was there so long I didn’t leave enough time for more than a sprint through the Deller exhibition, which was a pity. Even so, I’m glad I spent so much time at the Shrigley – it was well worth it. 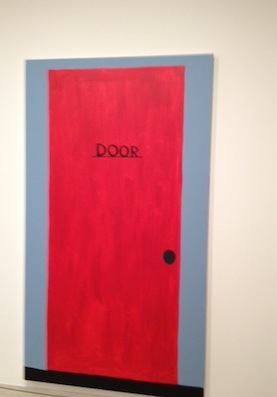 Thank you David Shrigley. 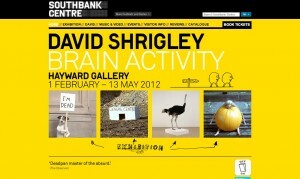 The pictures and photos reproduced here come either from the exhibition publicity or from a site, which I believe belongs to David Shrigley. I apologise if I have inadvertently infringed anybody’s copyright. Please let me know if this is the case.